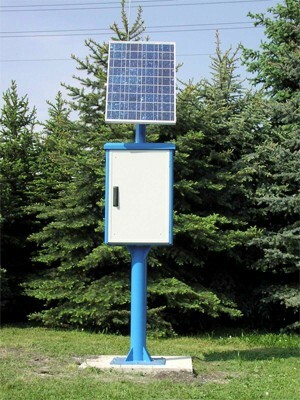 Our Solar Station offers measuring in an area where no infrastructure (telephone wiring and power supply) is available. The unit is equipped with a solar panel to supply the measuring instruments with power. The integrated accumulator is designed for a station operation time of about 30 days without power production and full power pack capacity. The data can be sent to a centre system via GPRS/UMTS VPN router. •	First class outdoor rack; o	For outdoor mounting o	The entire casing of the measuring station is completely made of aluminium o	design and colour suitable for minimizing visual impact to environment •	Solar power unit with: o	Solar module: 150W, o	Battery: 135Ah, 12V (battery life 5 years minimum) o	battery protected system All necessary cable interconnections and mounting equipment will be delivered.